$19 - Soft and cozy, this pretty textured ivory vest from Truly Me's fall 2016 collection can definitely be the perfect addition to your trendy tween's favorite fall ensembles. The vest can be worn open or secured by the two chic wooden buttons that cross the front of her chest. A trim of vintage inspired tribal print ribbon trims the edges of the vest from her neckline to her collar to add a subtle pop of ballerina pink color. 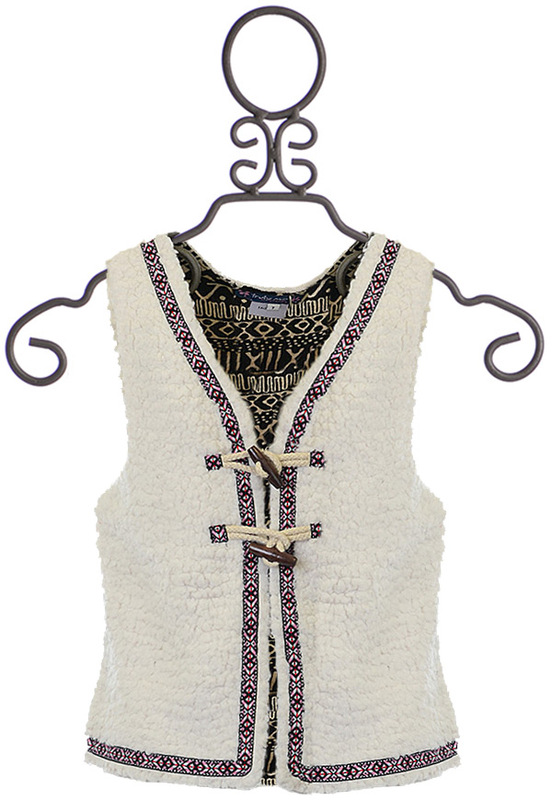 The inside of the vest is lined with black and ivory tribal print fabric to add an extra fancy look to this darling piece!